We’re all big fans of granola here. I love making it myself since I can customize it to what we like and make a large amount for less money than buying it in the store. This batch made about a gallon sized bag of granola. 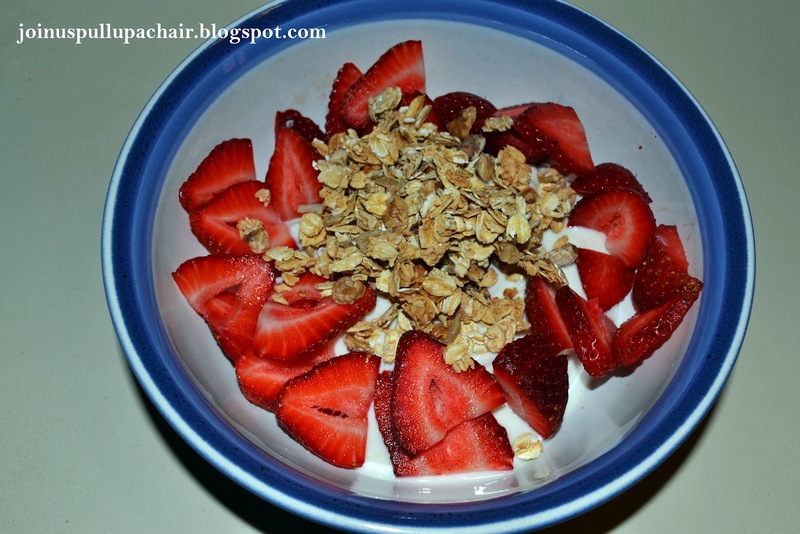 We’ve been using it as cereal and as a topping for yogurt…as I did below for breakfast the other morning. This recipe isn’t so great for snacking…it crumbles easily and doesn’t clump together well like other recipes. Preheat oven to 275 degrees. Line two cookie sheets with parchment paper and set aside. In a microwave proof bowl, combine the brown sugar and water. Microwave on high for 5 minutes and cook until sugar is completely dissolved. Let cool slightly and then add the vanilla and salt. In a large mixing bowl, combine the oats, chopped nuts and brown sugar mixture. Stir until completely mixed. Spread the granola over the two cookie sheets and bake for 45 to 60 minutes or until golden and crunchy. When granola has completely cooled, dried fruit can be added. Store in an airtight container.